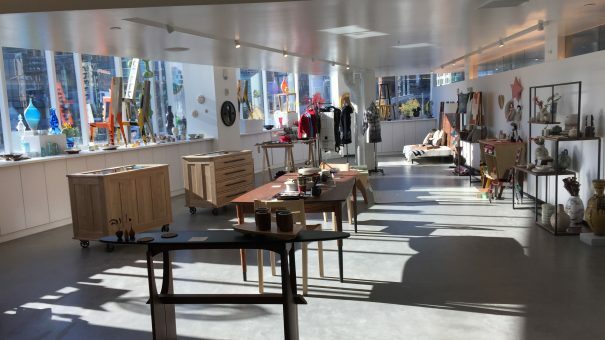 On October 6th, with a ribbon-cutting party attended by Boston Mayor Marty Walsh and hundreds of others, the Society of Arts + Crafts (SAC) officially opened its new home to the public at 100 Pier 4 in Boston (a view of the new Retail Gallery is pictured above). The dual mission of the SAC is to encourage the creation, collection, and promotion of the work of contemporary craft artists and to advance public appreciation of fine craft. To fulfill their mission, the SAC – which will turn 120 years old in 2017 – sponsors exhibitions, the Artist Awards Programs, and educational programming. They also promote the work of over 400 craft artists in both their galleries on an ongoing basis. Smith + St. John assisted the SAC in their move from Newbury Street to the Seaport district, managed the construction and budgeting processes, and coordinated relocation logistics. We continue to work with the SAC on long-term capital planning.